The application has been started and linked to a lead, and now the lead has submitted his answers to the application. Here's how to work through his answers. You can also communicate with the applicant via Application Questions. Assign representative: Choose an admissions user from the drop-down. Doing so will add this person as rep to all the applicants shown in the report—and will replace the current rep, if any. Tag Results or Untag Results: Create and add a new tag to all the applicants returned by your filter conditions, or search existing tags and remove them from anyone in your filtered group with that tag. Email applicants: This opens email in a new window so you can write these applicants a message. Text applicants: Send a text message to the applicants on the report. You'll have options to email those who do not have a verified text number, to have replies emailed to you, and to set visibility for this message on the applicants' activity feeds. Export XLS: Creates a spreadsheet of the applicants shown on the report. Applications > Fields breaks out individual application fields. The default filter view shows you all fields for applications that are in progress or have been submitted. See below for an explanation of application and field statuses. Click Export to create a spreadsheet of the fields shown on the report. The Questions report shows you all of the application questions your admissions department is working on. This article describes what you can do with application questions. Application statuses indicate the overall position of the application independent of the status of any individual field. In Progress: The applicant has started the application but has yet to submit it. Submitted: The applicant has submitted the application and now it's up to you to process it. Once an app advances from In Progress to Submitted, there is no turning back—an application can not be "un-Submitted". Pending Decision: You've accepted some fields, rejected others, and are awaiting other items—transcripts and online references, for example… basically, you're working through the application and are in the thick of it. Accepted: This application did the trick. You like the cut of its jib. It has that certain something you're looking for. Read more about accepting applications. Declined: This application did not do the trick. You dislike how its jib was cut. It lacks that je ne sais quoi you're after. Withdrawn: The applicant has decided not to complete the application or no longer wants to be considered for entrance at your school. Deferred: You may have accepted them, and they may want to confirm, but they want to delay their enrollment for whatever reason. Waitlisted: You have 100 openings, but this is the 101st application you've accepted. If there's room, you'd take them, but for now, they'll have to wait. In Progress: The applicant is working on this field. Normally, it indicates that he has started the application but hasn't yet submitted it. 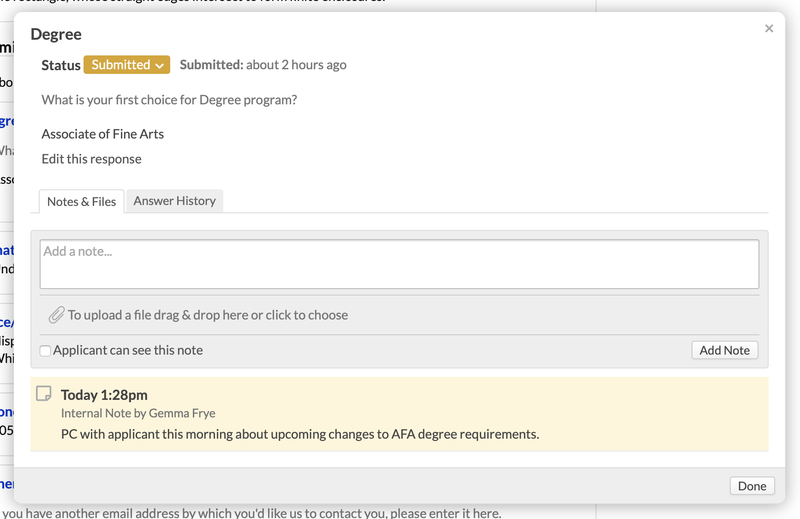 You can set a field back to In Progress after it is submitted if the applicant needs to do more work on it. Submitted: The field is ready for your review and decision. Accepted: You like what the applicant has to say. Rejected: The applicant's answer didn't pass muster for whatever reason. Feel free to send it back to him for improvement (In Progress) or leave it as-is. 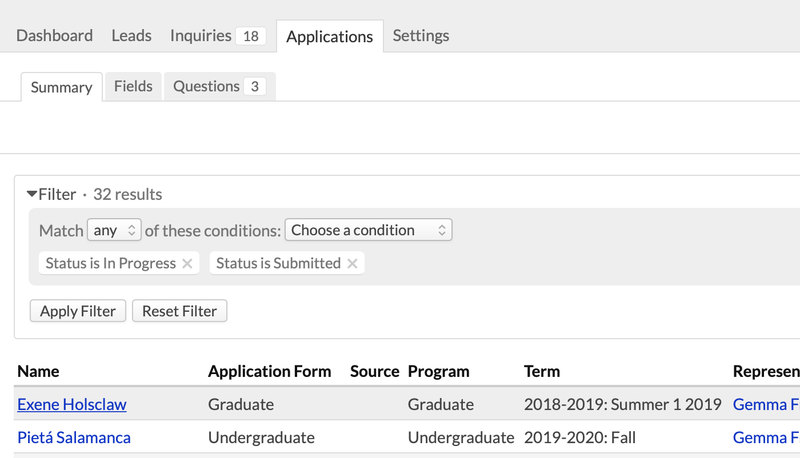 The Admissions Dashboard shows you all admissions-related activity, including updates to applications. Filter the dashboard to show applications from your leads. Then find the application you'd like to work on and click its name to go to its page. The Applications Summary lets you jump right into any application. Use the filter and click the applicant's name to go to the application. The Fields report also links you to applications. As with the Summary, just click the applicant's name to get to her application. The left side of the application page shows you the application fields. The right side shows you general information about the application: summary, basic info, and settings. Update any of the items on the right of the screen by clicking the field name and making your changes. Resend Application Link Email: If the applicant loses his unique application URL, just re-send it. Send Read-only Link: Lets you email a link to a read-only version of the application to anyone you wish (whether or not they're a Populi user). Print View: Lets you create a printable application view containing the fields, answers, and some basic information. Send Text Message Setup Email: If the applicant doesn't have a verified texting number, click this to send her an email asking if she'd like to set that up. Unlink Person from Application: If you linked this application to the wrong person, this unlinks it from that person; you must then it to another person before processing the fields. Clone application: If the applicant decides to postpone applying, this lets you clone his answers to a new application. Choose the new Entrance Term from the drop-down and click Save. The current application will be preserved so that your records show that he applied this time. His answers (and their statuses) will be cloned to a new application with the Entrance Term you selected—no need to duplicate the work you've already done processing his answers! Delete Application: The nuclear option, reserved for hopeless cases and needless mistakes. Processing applications consists chiefly of interacting with the applicant's answers: viewing answers, leaving notes, making decisions, updating statuses, and so on. Degree is the field's name. Click the name to interact with the answer. Submitted is the field's status. What is...? is the field's description, which comes from the application form. Associate of Fine Arts is the applicant's answer. You can view and update almost any part of the field. Change the field's status by clicking the drop-down and selecting a different status. Click edit this response to change the applicant's answer. Leave notes and files for internal use. You can also check to let the applicant see your notes when he views the application. Answer History shows you all changes made to this field and who made them; changes made by the applicant are unmarked. The field filter at the top lets you view fields with a certain status and, if desired, make bulk changes to them. Select which fields you'd like to Show—all fields, or only submitted fields, etc. The next drop-down lets you select all or none of the fields you've filtered. You can also check off individual fields. Use the Change status to... drop-down to change the status of all your selected fields to a different status. For example, you might filter to see the submitted fields; you then check off the acceptable fields and change their status to Accepted. Or you might look at all fields on a particularly dismal application, select all Submitted fields, and change their status to Rejected.